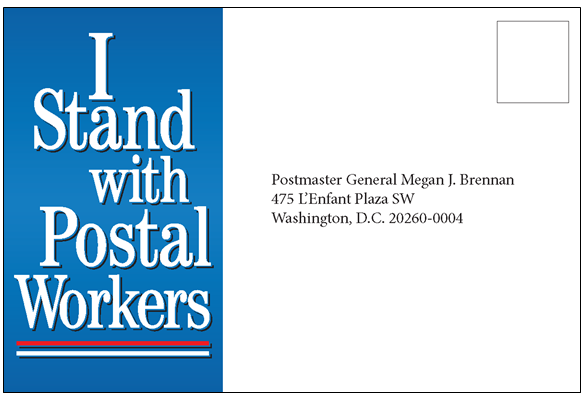 To show support for postal workers and a vibrant, public Postal Service, please complete the postcard below. We'll print it out and mail it to Postmaster General Megan Brennan. Thank you! I Stand With Postal Workers in the fight to keep post offices open and expand hours, for shorter wait time in line, prompt mail delivery, and enhanced services, such as postal banking. Good service is crucial to maintaining a vibrant, public Postal Service that connects residents and businesses in all areas and provides living-wage jobs that strengthen our communities!